Nothing is more frustrating than a persistent problem. Where do you turn when you’ve expended your troubleshooting toolbox? 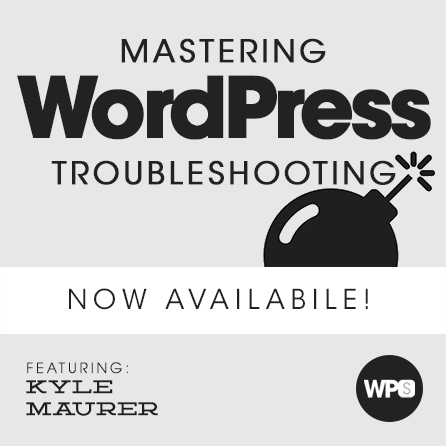 In this presentation, Kyle Maurer will show you how to tackle any and every difficult bug you might encounter with a WordPress website, whether you currently understand the problem or not. By the time the presentation is done, you’ll be equipped and ready to identify, research, and solve even the trickiest of website bugs. We’ve all experienced those difficult moments when a problem arises with our website which we can’t explain and have no idea how to solve. Websites are complicated. It happens. So how do we ultimately find solutions to these confusing problems? The answer is a process called “troubleshooting”. This process consists of a series of logical steps that all WordPress experts master. It makes it possible to resolve any issue in a simple, systematic fashion. In this session we will look at examples of problems WordPressers may encounter from the basics to some fairly challenging issues. Then we will walk through the troubleshooting process for each problem in order to demonstrate how critical thinking, logical steps and some helpful resources make any problem temporary. Kyle is the co-founder of a Jackson, Michigan based firm called Real Big Marketing which specializes in using WordPress to solve complicated problems for businesses. He is also the author of and a contributor to dozens of WordPress plugins, is the co-organizer of the Jackson WP meetup, is a co-organizer of WordCamp Ann Arbor, plays in a band and is an aspiring beer snob.